One of my favourite historical papers is that by Turner and Bradbury . Their study settled once and for all the argument surrounding Nobert’s final twenty-band test plate, the last of his famed 19th century series of diamond-ruled resolution tests . 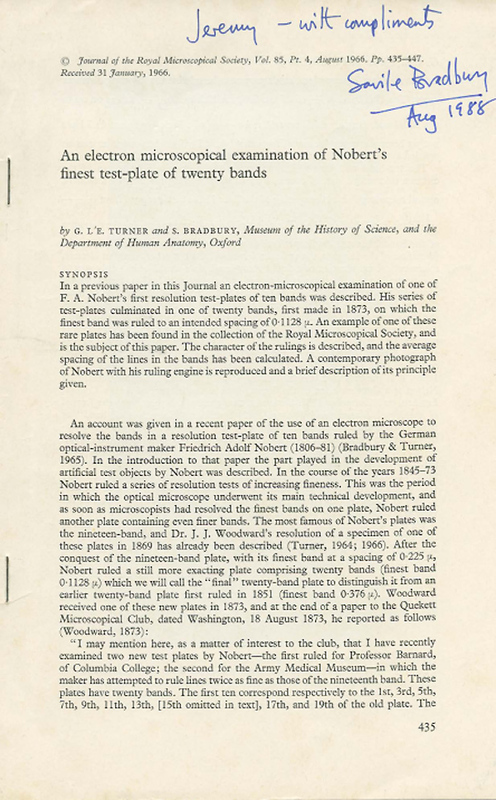 Nobert ruled his finest 20th band at an intended line separation of 0.113 mm in 1873, just before the theoretical work of Abbe on resolving power and image formation was published in English in 1875. We know now that these finest bands could never have been resolved with the light microscope. When the 19th band of the nineteen-band test plate (intended spacing 0.225 mm) was resolved by Dr JJ Woodward in 1869, Nobert promptly ruled another. 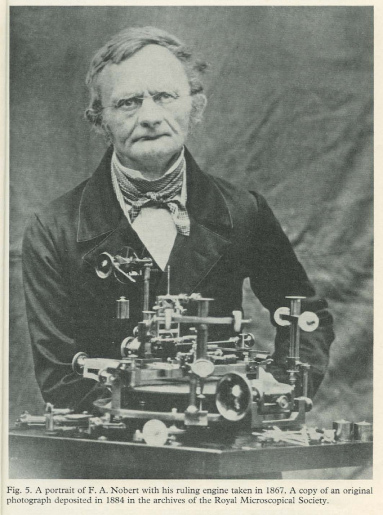 The finest ever band resolved by the light microscope, the 11th band of a line separation of 0.21 mm, was seen and demonstrated circa 1884 by that doyen of 19th century microscopy, Edward Milles Nelson . ‘aerial polarized black lines of light as to embarrass the minds of some gentlemen, and driven them to resort to a declaration of “spectral lines” without giving the slightest hint of their source’. ‘I now advisedly adopt the word incision, for the word line applies no more to these diamond cuttings than it does to the Suez Canal’. 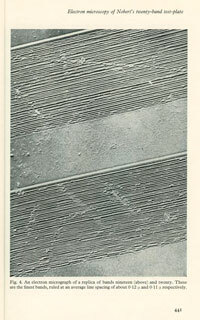 Others, including Woodward, suspected the veracity of the ruled lines, not merely from familiarity with the appearance of the test plates and working with them, but also from calculating Fraunhofer’s equations for the spectral colour reflected by the ruled lines which, as Woodward later pointed out, is ‘altogether independent of our ability to resolve the lines with the microscope’. We see the same phenomenon of spectral colour today reflected from the surface of a CD burnt with data. 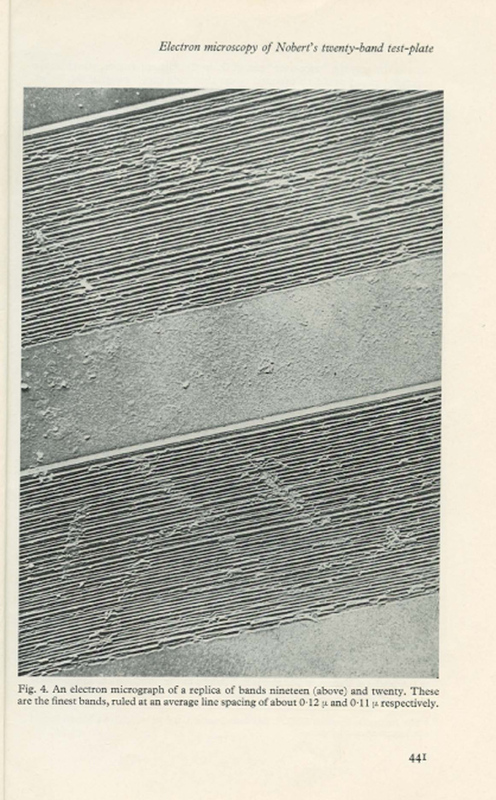 Turner & Bradbury showed unequivocally (with a carbon-coated plastic replica or ‘peel’ of the surface of the test plate) that the 18th, 19th and 20th bands were ruled at an average line spacing of 0.13 mm, 0.12 mm and 0.11 mm respectively. Any modern museum curator who read their methodology would have fifty fits, and this important work would never be carried out today in the same fashion … disassembly, dissolving the ruled coverslip free of the original cement, glueing it onto a modern slide with Farrant’s medium and taking a formvar replica! 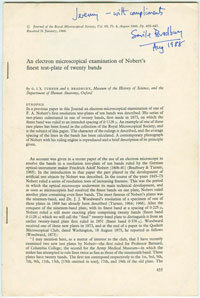 I have the original plate for Figure 4 of this paper, inscribed on the reverse, framed and hung at home. Nobert’s test-plates were devised as non-variable and absolute test standards, as opposed to the natural tests of resolving power (e.g. diatoms) that were used to assess the performance and quality of objective lenses. Nobert’s rulings were of such an incredibly high standard that people refused to believe that he had accomplished what he claimed to do. That mentality still exists in science today!